Warlock's Revenge is an Atari translation of an Apple game, Oldorf's Revenge. It is another graphics adventure and seems well done. I didn't encounter any bugs in my playing of it, and I had a good time, although I have to admit I'm beginning to burn out on generic adventure games. After a certain point, you see, I get tired of trying to figure out which implement I must use to get past a certain point. The game becomes boring, and settles into mere combination testing. While Warlock's Revenge suffers from this malady to some extent, it isn't nearly as bad as some I have seen. It wins points for this; there's nothing worse than an unplayable, un-figure-outable adventure. In this game, you are leading a party into a dungeon. You can be any of several different types of character (cleric, magician, and so on), each of which has special skills. These skills are needed to get past a certain point in the dungeon and to continue the adventure. Be prepared for a great deal of testing of combinations, or perhaps a short session of dumping the game database to the printer. Hint: the game is all hardcoded, with all pictures, etc., coded into the program. The pictures are all done in graphics 8, the highest resolution mode the Atari has. They seem to have had a good amount of work put into them, and the only detraction is that in graphics 8 the Atari doesn't put out a solid line, it tends to candystripe and change colors. This is called artifacting and can be of use to a programmer who understands it; the folks who did Warlock didn't, I'm afraid, so you would do well to turn off the color on your TV. The game itself is a fairly standard adventure, with pictures at each stop and two-word commands. It runs fast enough and is fun to play. I recommend it and had a good time playing it, even if (I must confess) I have yet to completely finish it. This one will take you more than a couple hours to do. In summary, while it may be "just another adventure," the game is a lot of fun and good to play. Don't let the fact that there is good competition for it worry you; just because there are several good games like it available, doesn't mean this one isn't worth getting. There aren't yet enough adventures on the market to swamp it completely, so if you're into such things, or if you would just like to give one a try, this is a good choice. Every reviewer has to fight a tendency to be sarcastic when he discovers a game that just doesn't make it. The urge to make cutting comments can be overpowering. In this case I was going to award the Cray-1 Speed In Arcade Games Trophy for this game. But that isn't how I view the purpose of a review. I prefer to try to make constructive comments on games that aren't quite right in the hope that the author(s) will consider my opinions and suggestions and, perhaps, improve the game. So we come to Kayos. You've guessed it--it doesn't make it. It is very well done technically. It runs faster than most, and obviously a great deal of work went into it. I have no complaint with it technically. However, its human interface isn't very good. It is simply too fast for people. Robots with emitter-coupled-logic reflexes might enjoy it, however. 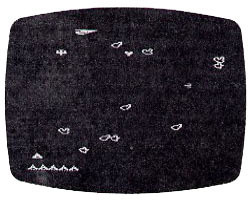 When you boot it up, you see a field of asteroids crossing space from left to right--a complex animation task for sure; someone worked very hard on it. At blinding speed a series of blurry objects comes out of the top of the screen and dives upon your emplacement; I could never identify what they were, they went so fast. My average playing time was around a minute or two, and I just couldn't see spending too much time on the game. Galaxians, and arcade games like it, are a challenge because they are not too fast. Much fiendish design effort went into making them just fast enough to be an agonizing challenge and not simply impossible. Kayos lacks this human engineering quality. It is a game sadly in need of a few strategically placed delay loops. Look for a reissue soon, I hope. This could be a fun game if it were slowed to a playable speed.